Virtualized infrastructure increases both server and storage resource utilization efficiency and enables service-oriented management of resources. Storage purpose-built for virtualized environments with scalable performance and management simplicity as foundational pieces is a must-have for realizing the full potential of virtualization. 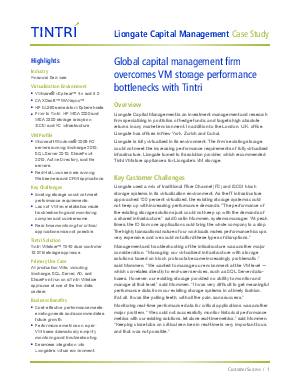 Tintri VMstore’s cost-effective performance using flash intelligently combined with granular VM and vDisk-level management allowed Liongate to successfully eliminate performance issues and simplify management. To lean more download this case study.